This morning we drove our Russian jeep/bus over the plains, following the hint of road and at times fording small streams. By midday we arrived at a horsecamp - every Mongolian household is a horsecamp - and picked out horses to ride for the rest of our Mongolian journey. On a 'test ride' I fell off my horse while it ran at full canter. The horse tripped and I flipped over its head and landed on my back in a rocky, dry streambed. Lesson learned - don't be too far forward while cantering. My guide told me, in broken English and pantomime, to lean back and pull sharply on the reins if the horse trips. Otherwise I will perform more gymnastic manuevers on this horse trip. When our interpreter, Girlee, the girl in the grey jacket, discovered that I didn't have riding pants, she made white chaps overnight from material we scrounged up at a local market. She cut and sewed the whole thing together in a few hours. These impromptu riding breeches saved me from horrendous blisters. Thanks Girlee! 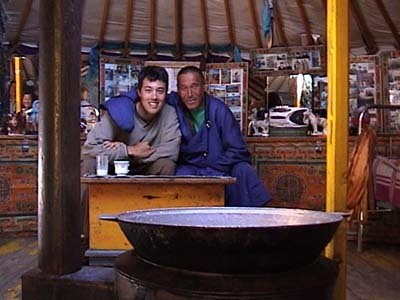 In our horseguide's ger, waiting for a bowl of Mongolian porridge to heat up (the porridge is made from rice, milk, and sugar - it's especially good if you add a little honey). Our guide is fairly prosperous - he owns ten horses - but he still lives in this small ger with his wife and six children! They move the ger 3 times a year, moving to a sheltered valley during winter and following better pasturelands the other two times. The horses roam free until they're needed; the horses never stray too far from their home territory, but on this day he couldn't locate all of them after a morning's search through the surrounding fields. We have 5 people supporting us on our horse trip: an interpreter, cook, support-vehicle driver, and two horse guides. Even with this many people, the trip is fairly economical - the two horse guides and their horses charged our travel company under $100 for the week!